Eisspeedway Journal: Photo-ICE SPEEDWAY INDIVIDUAL CHAMPIONSHIP RUSSIA 2018. Semi-final 1. Shadrinsk. Station "Torpedo". Photo-ICE SPEEDWAY INDIVIDUAL CHAMPIONSHIP RUSSIA 2018. Semi-final 1. Shadrinsk. Station "Torpedo". Team "Mega-Lada" (Togliatti) - Photo album. 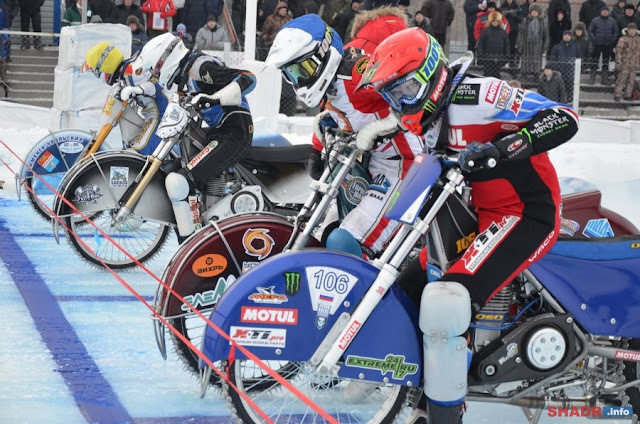 Eisspeedway in Bayern - Preview. Racer from Sweden held his training in Shadrinsk. Results of charges in Kamensk-Uralsky. International charges ended the race! Racing on ice: soon in Neftekamsk! No communication: DMSB nominated as he wants! Photo Fees and race in Slobodskoy! Photo Training camp with the Kumertau 10 12 2017. Czech Republic - Ice speedway Calendar 2018. In Slobodskoy began Training camp!